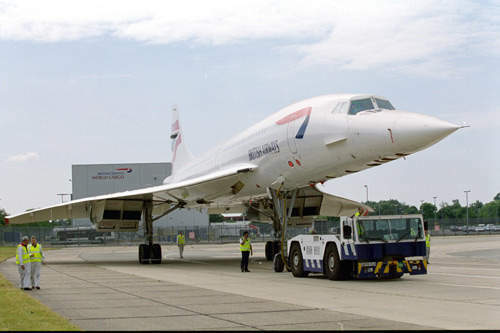 British Airways Concorde on the runway preparing for a test flight on 4 July 2001. November 2001, The Air France "Fox Bravo" Concorde returns to the skies. 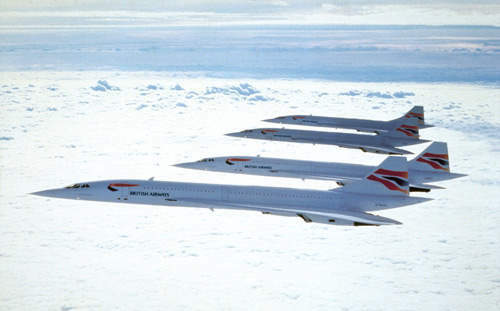 Four of the British Airways fleet of Concordes. 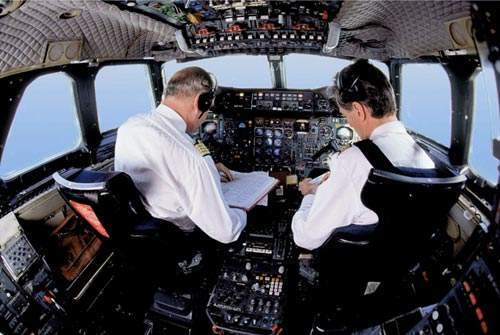 The Air France Concorde flight deck showing chief pilot and first officer preparing for take-off. A British Airways Concorde with a new "Chatham Dockyard" tailfin design. An Air France mechanic installing the Kevlar liner in an Air France Concorde. The Concorde aircraft, Alpha Foxtrot, was the first of the British Airways Concordes to be fitted with new Kevlar linings to the fuel tanks. Air France Concorde takes off for New York from the Paris Charles de Gaulle Airport. The conical nose is drooped hydraulically to -5&#176; for take-off and during the initial climb, and to -12.5&#176; during landing to provide the pilot a clear forward view. Concorde takes off from London's Heathrow for a less-than-four-hour flight to New York. The aircraft's four Rolls-Royce / SNECMA engines are each rated at 169.3kN. 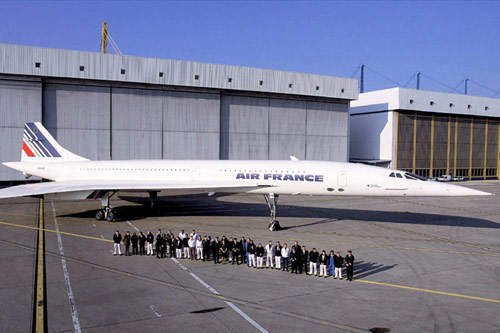 The Air France Concorde team with pilots, flight engineers and maintenance staff in front of the Air France maintenance hangar at Charles de Gaulle Airport. A view of Concorde through the windows of the British Airways Concorde Lounge at Kennedy Airport. 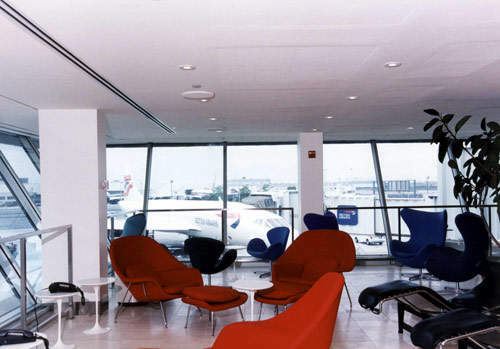 The Concorde lounges were designed by Conran. The Concorde supersonic airliner entered service in 1976. 16 production Concorde aircraft were built between 1966 and 1979. Production was carried out in France and in the UK with final assembly at EADS France (formerly Aerospatiale) in Toulouse and BAE Systems (formerly British Aerospace) at Filton. Seven aircraft each were delivered to British Airways (BA) and to Air France. One of the Air France aircraft was used for spares and another was lost in a crash in July 2000. 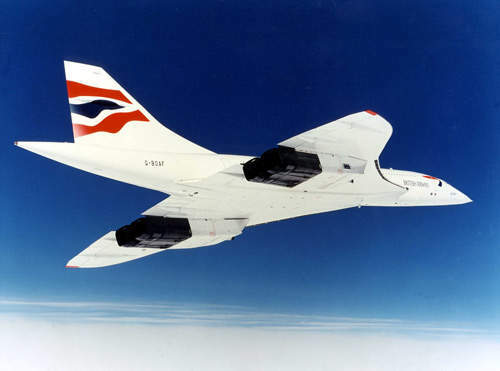 Following the July 2000 crash, Concorde fleets were withdrawn from service. An intensive programme of modifications, refurbishment and flight tests was undertaken and scheduled flights were resumed with the upgraded aircraft in November 2001. The upgrades included installation of Kevlar liners in the fuel tanks, new wiring in the undercarriage and new more resistant Michelin tyres. Scheduled daily flights by BA and Air France between London and New York and Paris and New York, and the BA weekly flights between London and Barbados resumed in September 2001. In April 2003, BA and Air France announced that the Concorde fleets would be retired due to falling passenger numbers and increased maintenance costs. An offer from Virgin Atlantic for the fleet was rejected on the grounds that Airbus (responsible for maintenance and airworthiness) would not support commercial operation. Air France ceased scheduled Concorde flights on 31 May 2003. BA flights ended on 24 October 2003. 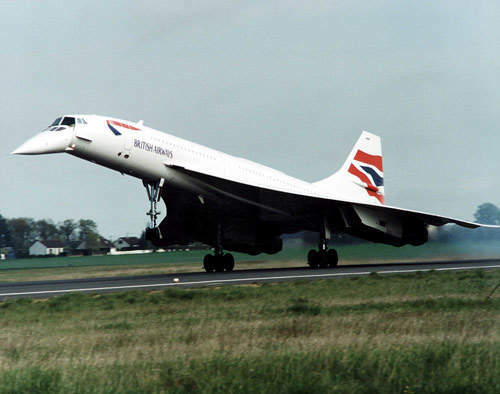 The final flight of a Concorde was on 26 November 2003 from London Heathrow to Filton. Concordes are being stored or kept at aviation museums around the world. 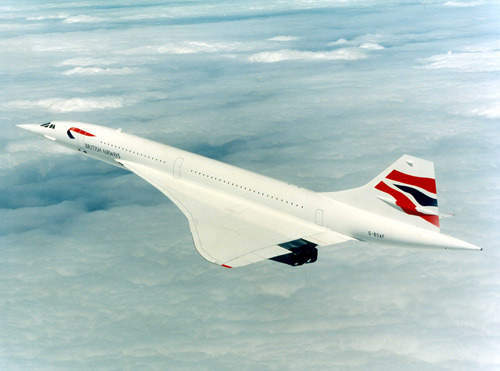 More than 2.5 million passengers flew on Concorde. Concorde flights took substantially less time than subsonic flights, providing for example an under four-hour flight time between New York and Paris. Concorde flights are comfortable because there is no atmospheric turbulence at the very high altitude, 18,000m, at which it flies. 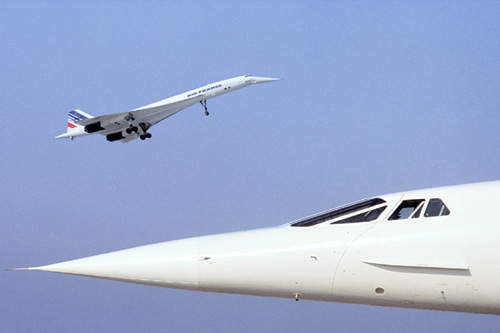 In November 2003, EADS announced its plans to work with Japanese companies to develop a larger and faster replacement for Concorde. In October 2005, aerodynamic testing was done on a scale model of an aircraft by JAXA, the Japan aerospace exploration agency. The model had the capacity to carry 300 passengers. If launched commercially, the model is expected to be in service around 2020-2025. 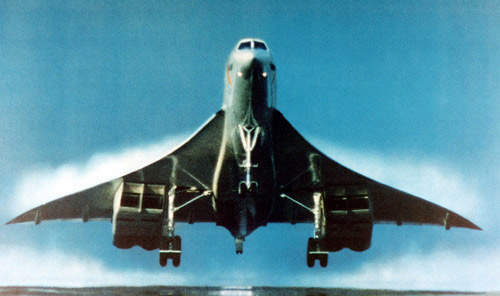 Concorde’s take-off speed is 397km/h, compared with a typical subsonic aircraft take-off speed of 300km/h. The aircraft accelerates to supersonic speed over the ocean in order to avoid a sonic boom over populated areas. The aircraft flies at 2,179km/h (Mach 2.04), which is just over twice the speed of sound. The range of the aircraft is 6,580km. Most flights are scheduled intercontinental flights, but Concorde has also been chartered to over 150 destinations. The flight deck accommodated the pilot and co-pilot side by side with a third crewmember seated behind the pilot on the starboard side. The automatic flight control system was developed by Thales Avionics (formerly Sextant Avionique) and BAE Systems (formerly Marconi). The primary navigation system, an AC Delco Carousel IVA, consisted of three inertial navigation systems each with a dedicated digital computer. The navigation suite also includes two VHF omnidirectional radio rangers linked with an instrument landing system (VOR/ILS), an automatic direction finder (ADF), two distance measuring equipment (DME), and a navigation marker. The aircraft is equipped with two RCA AVQ-X weather radars, two Thales AHV-5 radio altimeters and a Rockwell Collins terrain collision avoidance system (TCAS). The pilots’ communications systems included two HF and two VHF communications sets, a selective calling system and two air traffic control transponders. The passenger cabin accommodated 100 passengers in a single class seating arrangement. 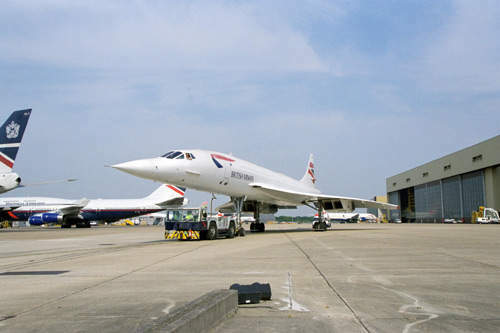 BA contracted aircraft interior design specialists Britax Aircraft Interior Systems, Camberley, Surrey; interior design company Conran and Partners, Surrey; and Factory Design, London, to work on the Concorde refurbishment programme. The interior upgrade programme included a new luxurious interior layout comprising 50 new passenger seats, six new cabin crew seats, new galley facilities, new lighting with a Blue Wave lighting feature and a passenger flight information display system (PFIDS3). Conran and Partners also designed the new Concorde Airport Lounge. Concorde is of cantilever low delta wing design. The aircraft measures 62.10m on the ground but during flight heating of the airframe causes it to stretch by 15cm to 25cm. The temperature in the thin atmosphere at cruise altitudes of up to 18,290m, ranged from -45°C to -70°C. At cruise speed and cruise altitudes the temperature of the airframe woud rise to +127ºC on the nose and about +100ºC on the wing. The heating of the airframe ensured the airframe is effectively free of corrosion. BAE Systems designed the forward and rear sections of the fuselage and Aerospatiale the rear cabin section. The aluminium alloy semi-monocoque fuselage was pressurised while the nose and tail cones are unpressurised. The characteristic conical nose drooped hydraulically to -5º for take-off and during the initial climb, and to -12.5º during landing to provide the pilot a clear forward view. The windscreen was fitted with a retractable visor that is raised hydraulically in the cruise phase of flight. The low set cantilever wing was of multispar torsion box aluminium alloy construction. The centre wing spars were of continuous structure across the fuselage. The tail unit consisted of a vertical fin and rudder with no horizontal stabilisers or control surfaces. The aircraft was equipped with four Rolls Royce / SNECMA Olympus 593 turbojet engines. The engines were fitted with thrust reversers and provide 169kN with afterburn. The fuel injection and reheat provided the extra power required for take-off and for the transition from subsonic to supersonic flight. The engine nacelles located under the wings consisted of an air intake, an engine bay and a nozzle support. The air intakes were of hydraulically operated variable area construction made of aluminium alloy and steel leading edges. The engine bay was equipped with a centre wall, aluminium alloy forward doors and titanium rear doors. The nozzle bay was constructed from welded sandwich panels and nickel alloy. The reverser buckets were operated by ball-screw jacks driven by compressed air. There were two groups of fuel tanks, the main group in the wings and fuselage and the trim tanks at the front and rear of the fuselage. The main group of tanks with five tanks in each wing and four tanks in the fuselage automatically maintained the aircraft’s centre of gravity in cruise flight. The trim tanks consisted of two forward tanks and one rear tank located in the fuselage beneath the vertical tail fin. The trim tanks transfered fuel rearward during aircraft acceleration to supersonic flight and fuel forward during deceleration from supersonic to subsonic flight, thereby maintaining a balance between the centre of gravity of the aircraft and the aerodynamic centre of pressure. The fuel system also acted as a heat sink to maintain thermal stability. New fuel tank liners, made of a Kevlar-aramid rubber compound were installed in the Concorde aircraft. The liners, developed by EADS France, minimised fuel leaks in the event of a wing being punctured. The technology was proven in its use in military helicopters. 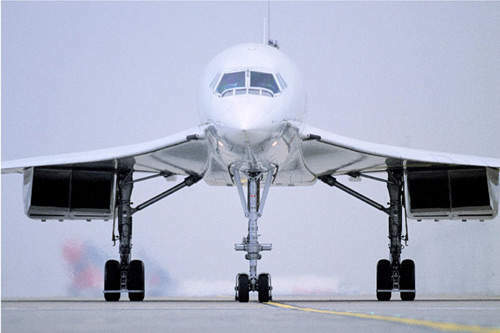 Concorde was equipped with hydraulically operated retractable tricycle-type landing gear. The steerable twin wheeled nose unit retracted forward and the four-wheeled main landing gear units retract inward. The electrical wiring in the undercarriage was encased in steel braiding as part of the modifications carried out during 2001. The original standard aviation design nylon bias ply tyres on all eight main wheels were replaced with a new puncture-resistant lighter weight tyre, the NZG Near Zero Growth tyre developed by Michelin Aviation Products. The Michelin tyres were rim-to-rim reinforced radial tyres that were resistant to incision. If severe damage should occur to the tyre it was designed to fragment into very small pieces too small to result in rupturing a tank. Expansion of the tyre under pressure and consequential elongation of the rubber tread was minimised by reinforced belts and sidewalls.